What should I monitor at home? 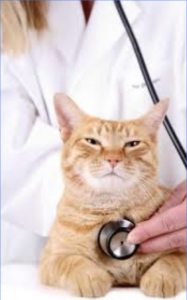 Breathing rate: In an effort to catch CHF (Congestive Heart Failure) early, it is important to become familiar with your cat’s normal resting breathing rate and effort at home. When your cat is at rest, watch his/her sides rise and fall as he/she breathes normally. One rise and fall cycle is equal to one breath. Count the number of breaths he/she takes in 6 seconds, then multiply this number by 10 to get total breaths per minute. For example, if you count 3 breaths in 6 seconds, that is equal to 30 (3x10) breaths per minute. A normal cat at rest should have a respiratory rate less than 40. If you notice this number increasing consistently, or notice an increase in the effort it takes to breathe, please contact your veterinarian. It may be helpful to keep a daily log of your pet’s breathing rate so that you will notice increases or changes from normal breathing. Use of limbs: Cats with heart disease are at a higher risk for forming blood clots. The most common way this manifests is through loss of use of one or more limbs, most commonly the hind legs. Monitor your cat for any dragging or inability to use the limbs. General: Monitor for any lethargy, collapse, exercise intolerance, coughing or decreased appetite. Contact a veterinarian if you notice any of these changes.